Our robot overlords are here to stay. Or are they? A group of kids are trying to change that. They are the Resistance as all the adults cannot help them now. 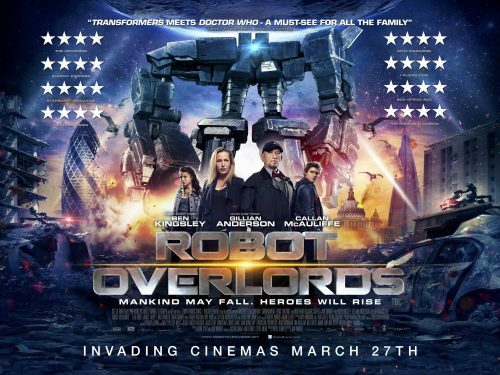 Robot Overlords, the great upcoming kids sci-fi film, has now got a trailer. not only that but a poster as well. the poster, as you can see, is very busy. It seems that they are trying to get then entire plot of the film onto the quad, landscape, poster. The adults lost the war and now the kids must save the world! Robots rule the streets and the people are locked in their homes. Stepping outside risks being vaporised by a hulking Sentry or picked off by a lethal Sniper. Through the ruins of Britain a group of kids, led by Callan McAuliffe, set out to join the Resistance. Hot on their heels however is their old teacher turned robot collaborator Mr Smythe, played by Ben Kingsley and his captive Gillian Anderson. Find out more about the invasion on twitter or facebook.